Lucas Leonard beaten to death by parents? Victim "maybe touching some of the other children," lawyer says. 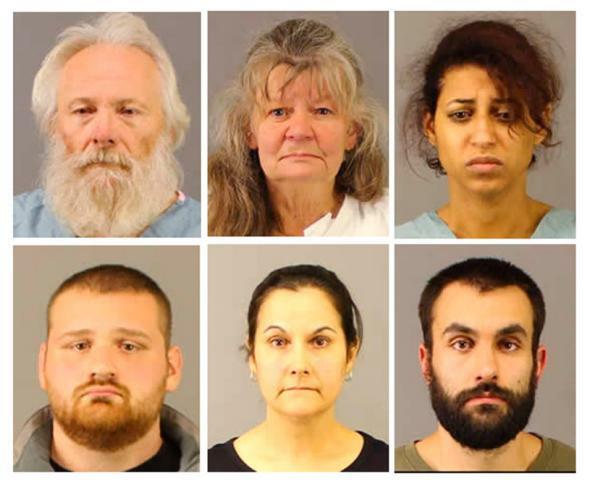 Bruce Leonard, Deborah Leonard, Sarah Ferguson (top L-R) and Joseph Irwin, Linda Morey, and David Morey (bottom L-R) have been arrested in connection with the beatings of 19-year-old Lucas Leonard and his 17-year-old brother Christopher. The meeting was orchestrated by the pastor, Tiffanie Irwin, 29, who called the teenagers into a sanctuary of the church’s three-story former schoolhouse, the authorities said. Her mother, Traci Irwin, is the congregation’s spiritual leader, and the congregants refer to her as Mother. The beating began around 9 p.m. on Sunday and lasted until roughly 7 a.m. on Monday, the prosecutor, District Attorney Scott D. McNamara of Oneida County, said on Thursday. Parents Bruce Leonard, 65, and Deborah Leonard, 59, are accused of manslaughter in Lucas’ death; four other church members have been charged with assault for the attack on Christopher. Devin Garramone, an attorney representing Deborah Leonard, said that what began as a “mild flogging” in which his client did not participate had “spun out of control” and blamed Tiffanie Irwin for exercising poor judgment by allegedly calling the meeting to discuss molestation rumors. A former parishoner told the Times that Tiffanie Irwin’s father Jerry, the church’s late founder, often humiliated church members by discussing their past misbehavior during sermons in which he was also known to use racial slurs. Another one of Irwin’s children, Joseph, was arrested in Christopher Leonard’s beating, as was the Leonard brothers’ sister Sarah Ferguson.